According to Senator Claire McCaskill, we should all feel better--even relieved--that President Obama decided to release a classified legal memo regarding our past interrogation techniques. Because terrorists will no longer be able to use as a recruiting tool the fact that America tortures people! Now terrorists will be forced to go back to the techniques they used before 9/11--techniques they used to recruit 19 people to fly airplanes into buildings. No? Maybe you should watch this short video of Senator McCaskill on Fox News Sunday with Chris Wallace. I entitled this Obama's Coverup, but an arguably better title would be The Media's Coverup. 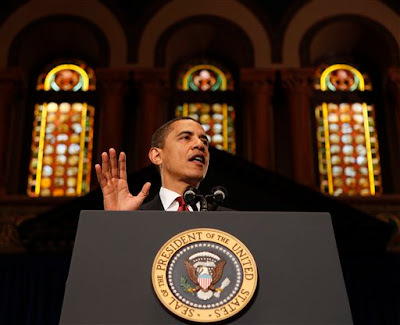 On April 14th, President Obama spoke at Georgetown University where he (The White House) insisted a symbol representing Jesus be covered up. Not surprisingly, there are very few news reports about this. 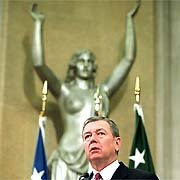 Remember when John Ashcroft had his episode of covering up backgrounds? Remember how that was covered in the media: the evening news, newspapers, late night talk shows. Anyone who was even remotely paying attention knew what a "prude" John Ashcroft was. Yet how many people know that President Obama said we aren't a Christian nation--not just recently on his trip to Europe, but many times over the past years? Probably the same number of people who know that he wouldn't speak at Georgetown until a Christian symbol was covered up. That's why a better title might be The Media's Coverup.